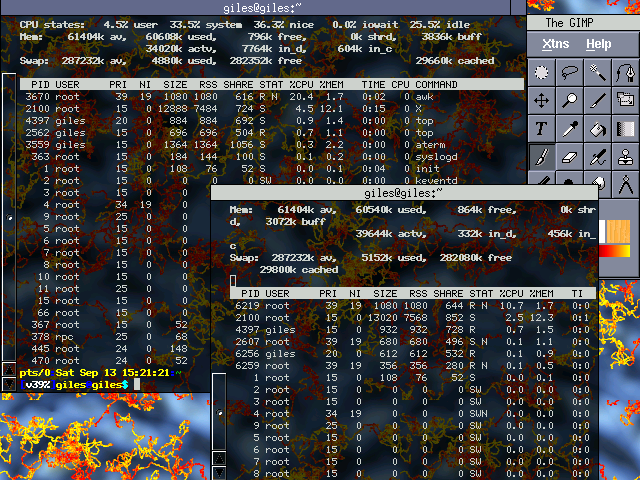 AEWM++ aka Sapphire screenshot. The focused window is the one in back at the upper left. 1.0.24 from April 2003, the most recent as of September 2003. Incomplete and incorrect. The man page says there's no way to move windows between workspaces, but right-click on the titlebar provides a workspace menu to send the window elsewhere. AEWM++ is a rewrite of AEWM in C++. Since AEWM has been so successful as a base for other window managers, the author(s) thought that a C++ port would be useful. However, they've introduced quite a few changes is the process, including multiple workspaces. The window frames comes equiped with only one button, but (like aewm) it's multipurpose: left click minimizes, right click kills, middle click resizes. A double-click on the titlebar maximizes the window, and middle-click on the titlebar shades or unshades the window. Right-click on the desktop runs some command (which can be specified on the command line). There is no menu system - they recommend using fspanel, a small menu app. Many options can be specified on the command line. I encountered a major bug (unless of course it's a feature): sometimes windows come to the front and stay there, even when another window has the focus: it appears the focused window tries to get in front and lose the fight. If the authors expect others to use their code base for creation of further WMs, they have some clean-up to do. There's an IRC channel. I don't know how active it is.